Traditional material dial tables, manufactured from either aluminum or steel, have tooling attachment holes drilled and tapped into the dial surface. Of particular interest is the pull out performance of threaded inserts in the carbon dial table compared to drilled and tapped holes in traditional dial tables. Tooling attachment is usually accomplished using steel socket head cap screws with a tensile strength of 190,000 psi minimum. 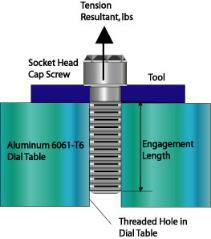 Before looking at the pull out performance of a threaded insert and comparing it with the pull out performance of threaded holes in aluminum and steel dial tables, it is informative to look at the screw first, with respect to diameter, threads per inch (Unified Course [UNRC]Unified Fine [UNRF]), thread length, tensile strength, and recommended seating torque (based on 100,000 psi Tensile Stress in the Screw, REF Unbrako Screw Data Guide). Screw sizes are those usually encountered in the automation assembly industry for attachment of tooling. Bolt analysis performed using FUTEK screw torque calculations, Aluminum Mic6 yield 15,000 psi, k=2. Bolt analysis performed using FUTEK screw torque calculations, Aluminum 6061-T6 yield 40,000 psi, k=2. 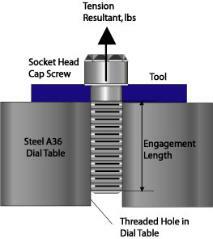 Bolt analysis performed using FUTEK screw torque calculations, A36 steel yield 36,000 psi, k=2.